This is a privately owned unit and guests are renting directly from the homeowners whose company name is HBR 3303-4, LLC (as will appear on your credit card statement). Therefore your reservation is non-transferable between other properties. A $250 security deposit is required with this reservation and we will process a credit card authorization in that amount prior to your arrival. This authorization will expire after your departure assuming no damages or fines are incurred. A charge may result for damage to the condo, missing contents or for exceeding the stated number of overnight guests. If a guest arrives without notice earlier than the scheduled check in time of 3pm or fails to depart by the required 10am checkout time, their security deposit which is on hold will be charged in full. Our units hold very busy time lines and the failure to leave on time can cost money and schedule disasters. Likewise arriving earlier than scheduled can disrupt the busy cleaning flow, cause mishaps and confusions with the housekeeping staff. The regular occupancy for 3304 is 2. The regular occupancy for unit 3303 is 2. The regular occupancy for 3303/04 is 4. Guests are obligated to disclose the actual number of occupants prior to arrival. At no time should anyone sleep on the sofa. We provide sheets for each bed and two bath towels per stated guest. There is no daily housekeeping service, but you are welcome to use the washer/dryer in the unit if you are renting 3304 or 3303/04. If you are renting 3303 only, you are welcome to use the coin operated washers by the 2000 building. If you have an interim clean included with your reservation we will launder the linens during the clean. Please do not leave personal laundry in the washer when housekeeping is coming for the interim clean. My wife and I stayed for a week with our adult daughter. 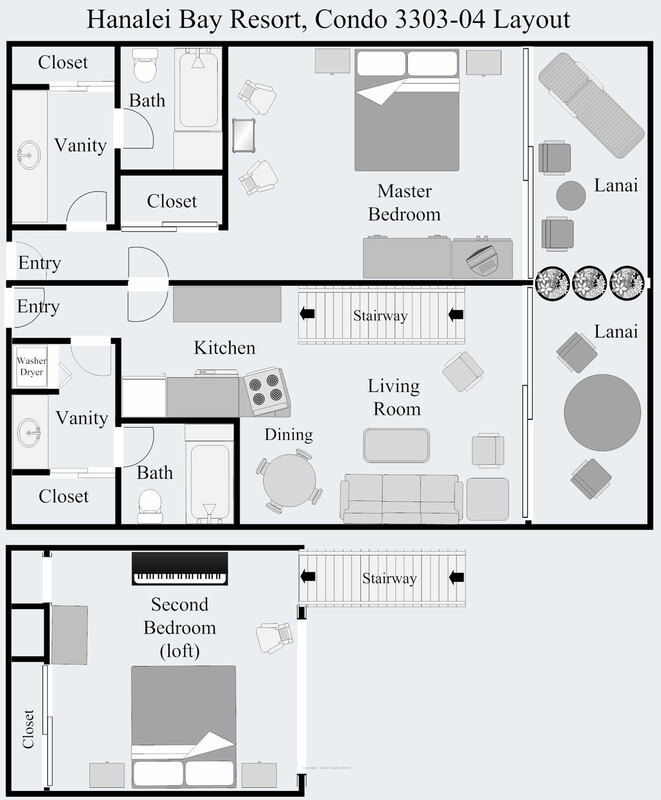 The two well separated bedrooms and two baths made this very easy. The unit is on the top floor and it has an uninterrupted 180 degree view of the Hanalei Bay, Tunnels Beach in the distance and the St. Regis from the large lanai. Passing showers produce rainbows right in front of you every morning. Everything you need for the beach or pool is provided. The beach is an easy walk down hill and you can call the resort for a ride back up if you wish. The beach is shared with the St. Regis, so you can easily access their beach bar and restaurant or go up to the lobby for dinner at the bar or more formal restaurants. You can also rent kayaks and other beach gear right at the beach. The Hanalei Bay resort has beautiful grounds. They are working on the restaurant, bar, and swim-up bar, which will make it much better. The pool area is excellent. A great condo just a short walk to the parking lot. Unlike many other condos at HBR, there is no change in elevation between the parking lot and this building, so it is just a few steps and 2 flights up to the condo. The best feature of the unit is, of course, the jaw-dropping view of Hanalei Bay and the surrounding Makana Mountains. Sweeping views of Hanalei Bay & the surrounding Makana Mountain Ridge will inspire you! This condo overlooks the paved path leading down the bluff to the beach. Watch the world famous surf breaks of Hanalei Bay & see the colors and waterfalls of the mountains change throughout the day. Our spacious lanai has a table for four plus a chez lounge with side table. The two sides of the lanai are divided by tropical plants. You will be very comfortable sitting on this covered lanai taking in the sites! Located just steps from the parking lot, the entry doors feature louvers which allow comfortable airflow throughtou the condo. Our kitchen has a full size refrigerator, a four burner stove, double sink & dishwasher. We also have a coffee maker, toaster, microwave and many conveniences for cooking & baking including a vintage Hamilton Beach mixer! Our dining table for four is cleaverly surrounded by mirrored walls so you can see the spectacular view of Hanalei Bay from any angle! Our cozy tropical living room features a sofa & 2 upholstered chairs. There is a TV, DVD, CD/cassette player. A full size washer/dryer is available for your use in the closet of the bathroom closest to the kitchen. The master bedroom has a King size bed with side tables and reading lamps. A custom made large teak desk with large lamp is perfect for those who need to do a little work while on island. This room also features a small fridge, 2 swivel chairs and side table, as well as a ceiling fan, A/C and an alarm clock. This full bath has a large vanity with a single sink, a closet with iron/ironing board, a full tub/shower & ceiling fan. The bathroom is divided into 2 rooms: the tub & toilet room and the vanity & dressing area room wich also features a full size closet. The cozy, breezy loft features a King bed, TV w/ VCR, full length mirror, 3 speed ceiling fan and a large opening overlooking the living room (with vertical blinds for privacy). It even features a well-tuned piano! There are two separate entrances: one for the master bedroom side and one for the kitchen/loft/living side with adjoining doors between the kitchen and master bedroom.As you come in boathrooms are to your right and left. the master bedroom is to your left, and the kitchen to your right. Stairs along the living room wall lead to the loft. Both sides of the unit have a lanai (divided by tropical plants) which face west toward Bali Hai. Conveniently located at the end of the parking lot, this unit offers the best of both worlds: fantastic views without the walk! The condo we stayed in was bright, clean and had everything we needed. The view from the balcony was beautiful. It was wonderful to have the pool, BBQs, concierge services and even a restaurant on the premises. The grounds were immaculate and lush...just what you’d expect from a tropical paradise. Our only suggestion for improvement would be there needs to be a light on the balcony for otherwise the space in unusable after dark. Thank you for your response for our request for a review on unit 3303/04 at the Hanalei Bay Resort. We are so glad that you enjoyed the condo and the resort and it met your expectations. The Hanalei Bay Resort does not have lights on the lanais. However because the properties are on the bluffs, the lanai lights are mistaken by the Shearwater birds for the moon and it causes the birds to fly into buildings. Therefore there are limitations on lights on lanais. We had a fabulous week at the HB Resort. Very accommodating. Lovely arrangement for us with our two adult children. Something for everyone. Enjoyed exploring all around. Consider it very special to have been able to stay there. Love to come back. Wow! Pictures don’t do it justice! This was lovely, we had both 3303/3304 and the view, the view, the view - from both lanai - incredible!!! steps from the pool, close to parking lot, this couldn’t have been better. I thought from the pix and some comments that the furniture/decor might be a little outdated but it was all perfect, in fact felt very comfortable without feeling like being in a cookie-cutter condo. Only regret is I wish we’d stayed longer! Would definitely rent again given the opportunity! We are a family of four and loved our stay in Unit 3303-04 at the beautiful Hanalei Bay Resort. The view from the unit is spectacular. The unit was clean, comfortable, and quiet. It had everything we needed for a great stay. We would definitely book this unit again. We had a great time in Kauai and thoroughly enjoyed our stay at Hanalei Bay Resort! Condo 3303/4 was very clean and offered all the amenities we needed down to beach chairs, snorkeling gear, trash bags, and light bulb replacements! The beds were firm! Having a washer and dryer were a great plus! I would say that the decor could use some updating and there was a little bit of musky or moldy smell when we first arrived but after the A/C ran for a while we didn’t notice it! I would definitely stay there again! We so appreciate you taking the time to post for the unit 3303/04 at the Hanalei Bay Resort. We are glad to hear you appreciated the cleanliness and the amenities offered. We do try to think of things that will make our guests have a great vacation. The washer and dryer are brand new and glad you could make use of them. Decor is individual taste and with owners determine how it is decorated. Extensive pictures help each guest to determine what might work for them in this area. We are so glad to hear you would stay again and we hope you will. Although a little dated, this condo is in good condition and has a spectacular view. My husband and I loved sitting on our lanai and watching the surfers in the bay. We wished for binoculars. The kitchen is tiny with miniature oven. Had hoped to cook a pizza but no pizza pan, and it may not have fit anyway. So we were fine with dinner at Happy Talk one night, take out another night, and pizza at the Princeville Italian restaurant. The grounds are great. The whole Princeville development is first class. Except for needing some updates, I highly recommend. We really enjoyed are stay at Hanalei Bay Resort. The view from the condo 3303-04 was spectacular! The condo was clean and well cared for. We really enjoyed the pool, tennis courts, and short walk to hideaway beach. We found the shopping and Thai restaurant in Princeville delightful.I was especially pleased with the prompt attention we received from Aloha Condos and Homes when the air conditioning went out in condo 3303. Kristen did everything she could do to fix the problem and kept in constant communication with us.We would definitely stay here again!! Thank you for taking the time to post a review for the condo 3303/04. The views are pretty special from this unit! We so appreicate mentioning our contact with you on the unfortunate AC problem on the one side of the condo and the condo cleanliness. We do our best to be attentive and resolve things as soon as we can. We certainly do hope you can come back again and soon! We enjoyed our stay very much. Other than the smoke alarm going off in the middle of the night it was great. The view is perfect!! This is one of the nicest condos in Hawaii. Perfect location, well set up, comfortable and just right for the best vacation you will ever have. The pool is close by and is divine, the beach is warm and inviting, the staff are friendly and helpful. One of our favourite spots in the world. Highly recommended. We (2 adults + 2 teenage children) stayed in Condo 3304 on its own for 2 nights and then a further 2 nights in Condo 3303-3304 combined (as 3303 was already booked for the first two nights). We had previously stayed in 3303-3304 in 2009.We loved our stay and the Condo ticked all of the most important boxes for us: - fantastic views of Hanalei Bay across to Bali Hai; - great resort (HBR) in the best location on Kauai - Princeville Coast facing West (so best views and walking access to beautiful sheltered beaches), close to Na Pali coast / Kapalua Trail / Ke'e Beach;- clean with small but serviceable kitchen (so could cook our own meals), all needed equipment (including some snorkeling gear and beach chairs);- short flat walk from car park and pool (noting that some condos at HBR have quite a hilly hike from the car park; - quiet top floor with large private lanai (if you have both 3303-3304 - see below);- good price.The negatives were relatively minimal for us (our far outweighed by the positives). The sofa bed in 3304 is not quite flat - making it somewhat uncomfortable for anyone but small children - albeit we remedied this by smoothing it out with some strategically placed cushions and blankets under the mattress. Also, if you rent 3304 on its own, you share the lanai with 3303, separate by 3 pot plants. But this was not a major issue for us on our stay. In summary, this is a fantastic condo and resort to stay-in. If you can, i recommend taking both 3303 and 3304 together. The Princeville / Hanalei area is heavenly - and the views, location and facilities of HBR 3303-04 are hard to beat - much better than paying much more for the same view and location - but less facilities (no kitchen) and 4 times the price at the St Regis next door. Mahalo for the great review for unit 3303/04 at the Hanalei Bay Resort. It is always wonderful to have returning guest who enjoy the condo and the amazing views! The top floor does allow for the open beam ceilings making a spacious feel. It is important for us to keep the condo well equipped accommodating our guest and meeting their needs for a great vacation. The mattress on the sofa bed is actually brand new but we will look into it. We hope you can come again in the near future! This condo has a great location....close to parking (so easy to haul your stuff), the pool and a perfect sunset view of Hanalei Bay. The condo is well stocked with everything you need for the beach and in the kitchen. I also think the price is very reasonable considering the awesome ocean view. Checkin was friendly and flawless. The unit was clean, operational, attractively appointed. The rental team was available, friendly and efficient. The view from this unit was to die for---mountains, waterfalls, Hanalei Bay and the open ocean. The surf was audible. The beach in front and a short walk down the path was a delight with transportation if desired a phone call away. Parking was close by but without any traffic noise. The unit was furnished with everything you would want from kitchen to beach equipment. We will be back. We absolutely loved staying at Hanalei Resort and loved the condo for the view, the location, and it was very comfortable, cozy, and had all the appliances and things we needed. But, I would just like to point out that we had trouble with the toilet clogging two different times and had to call for service and the laundry door came off in my hand. Suggestions for the condo might be complete snorkel equipment, upgrading the toilets and more ventilation upstairs in the loft. But overall, we appreciated your condo and the beautiful view. Thank you!!! Awsome view with very comfortable space and ameneties. This condo was absolutely perfect for some play time on the North Shore. Centrally located for all of our activities. The pool was amazing, I coudn't get the kids out of the water. We used the BBQ facilites for our family dinners on property. I would love to come back and stay here again soon.